The Apple Apps Store has thousands of games, and it is ever-growing. But, if you own an iPhone or iPad, you may have heard of XmodGames. XmodGames is an app that offers latest mods for free and also comes with the ability to record and share the iOS gameplay videos with others. Some of the most popular game mods offered by XmodGames includes for games like Clash of Clans, Minecraft, Clash Royale, Candy Crush Saga, Angry Bird, 8 Ball poor and more. You name it, and XmodGames have it all! Earlier the XmodGames was only available for Jailbroken devices. However, the developers have now released XmodGames version of non-jailbroken devices. There are three methods to install XmodGames on iOS for iPhone and iPad. Today, I show you how to download and install XmodGames on iOS without Jailbreak. XmodGames comes with a lot of mods that are not available anywhere else. Built-in Screen Capture records gameplay video in HD resolution. It also has share option to share the recorded gameplay videos with others. Game mods for games like Clash of Clans, Pokemon Go etc. Great community and discussion forum for troubleshooting any problem. Comes with timely support and multiple mods support for better gameplay. XmodGames support all the versions of iOS above iOS 9.0. So you should be able to install XmodGames on iOS 9.0, 10, 111 and 11.3. 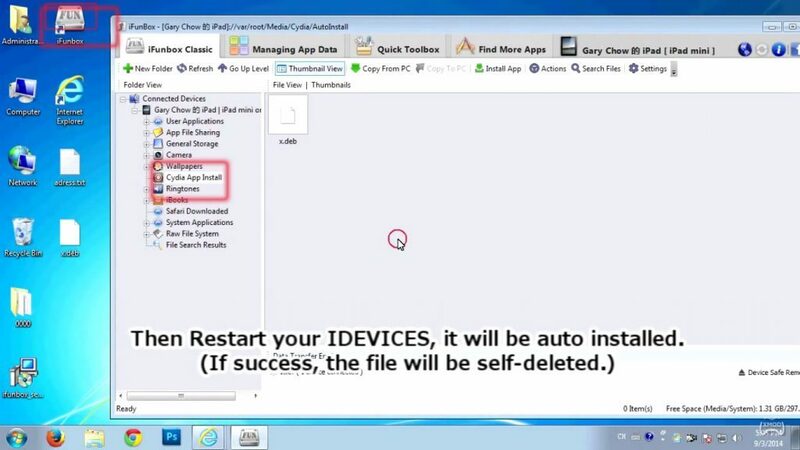 This method is for non-jailbroken iOS devices. Hence we need to download a third-party tool called iFunBox to be able to install the XmodGames x.deb file on the iOS device. Begin with downloading the iFunbox tool from the official website here http://www.i-funbox.com/. The tool is available for both Windows and Mac users, so download the appropriate version. Run the installer to install iFunbox on your PC or Mac. Next download the XmodGames.deb file to your PC. Connect the iPhone or iPad to the PC using a USB cable. Open iFunbox. Wait for a few seconds and now copy the d.deb file into it by following the below steps. Click on iFunBox Classic tab. Next click on Connected Devices and select Cydia App Install. Now drag the x.deb file into Cydia App Install section on the iFunbox tool. Restart your iPhone or iPad. When the iPhone restarts, iFunbox automatically installs the x.deb file onto your iPhone. If the XmodGames is successfully installed, you can launch it from the home screen. That’s it. You have successfully installed XmodGames app on iOS for iPhone and iPad. XmodGames will also be compatible with future version of iOS, so you don’t need to look for an alternative when a new version of iOS comes out. And if that happens, you can also use iTool for Windows and Mac as an alternative to the iFunbox if you want.